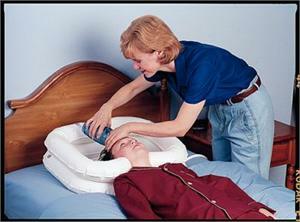 Cushions neck and shoulders and supports head when washing client’s hair in bed. Inflates by mouth. Manufactured of heavy-duty vinyl. Drain hose removes water and suds. 24"W x 20"L x 8"D. Latex free.